Lollapalooza gets high marks for a location that practically demands fans use public transit, accomodates bikes, and makes use of an existing public park. The festival also scores well for giving generously to the Parkways Foundation. On the "needs improvement" front, there's no meaningful effort to engage fans in the sustainability initiatives, the waste management plan, while well-developed, needs a Rothbury-like overhaul to get to zero waste, there's no dedicated green coordinator or consultant, and the "Green Street" area is little more than a token gesture. This is a festival that needs to reevaluate its green goals to stay current but has serious potential to recapture a position of leadership if management can match its words with actions. 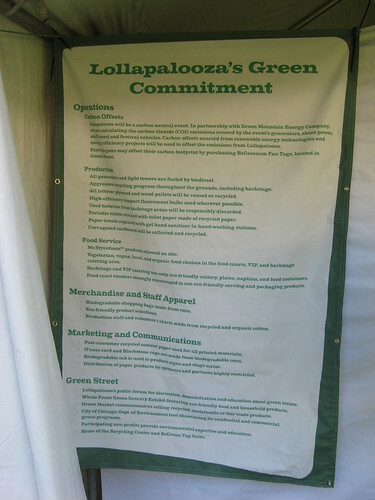 Lollapalooza's green commitment, found tucked behind a curtain in an obscure booth in the well-hidden Green Street area, reminiscent of the plans to destroy Arthur Dent's home. 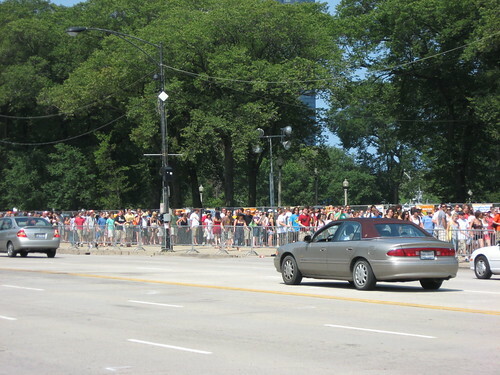 Lollapalooza turned out to be a much more intense experience than I'd anticipated, largely because of the crowds. This year marked the festival's first sellout at Chicago's gorgeous Grant Park, with 75,000 people streaming through the gates each day. 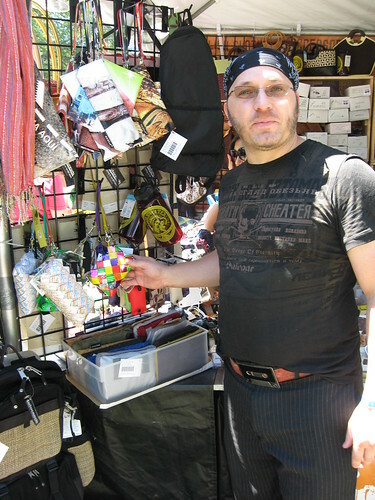 That's about the same size as the nation's other granddaddy of festivals, but on a much more compact site. Logistically speaking, the festival operated with the precision of a Rolex. With so many years of experience, Perry Farrell and the C3 crew have had plenty of time to work out all the bugs. From the press area, head and shoulders above the press tents I've seen at other festivals, to the weather--a hot and humid but dry three day stretch sandwiched between strong thunderstorms on Friday morning and Monday--it seemed like everything was coming up Lollapalooza this weekend. The only real hangup was the waiting. When I arrived Friday about 1, I saw what is without exaggeration the longest line of people I've ever laid eyes on, a line that stretched several city blocks in both directions, with people standing 6 abreast. Once inside, lines for the chemical toilets, which remained remarkably clean throughout the weekend, often reached 30 minutes. Getting a beer could also be a challenge, especially if you didn't want a Bud Light--the line at Leiderhosen's micro-brew* beer tent was over 30 minutes. The lines on Friday stretched for blocks. The truly remarkable thing about all of this was that despite the human queue, there was no automotive traffic associated with the event. Walking from the bus stop, I saw plenty of Lollapalooza-bound foot traffic but otherwise anyone visiting downtown would have had no idea that there was a smaller city within the city just a couple of blocks away. That's an amazing feat. Sure, some folks (myself included) arrived by taxi, and a sizable chunk of people (again, guilty as charged) flew in, but once in Chicago almost everyone used public transit. Parking lots just blocks away from the festival were empty all weekend. It's a testament to picking the ideal location for the festival--a beatiful site in a city large enough to accomodate the extra traffic, with plentiful hotel options and a robust public transit system. Other festival organizers involved in multiday noncamping city festivals should consider this as the model for what to look for in a festival location. 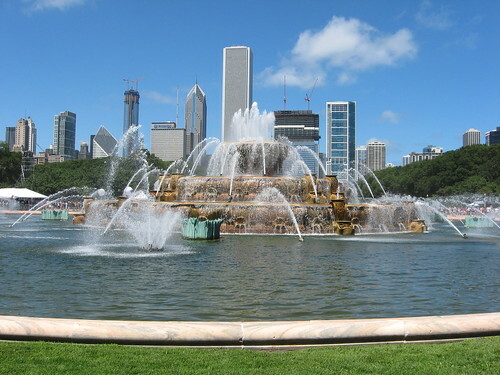 Buckingham Fountain, the centerpiece of Grant Park and the geographic center of the festival. So organizers tackled traffic by picking a near-perfect site location, but how green was the rest of the event? To answer that question, I hoped to catch with Stacy Rodrigues, the festival's de facto greening coordinator and the replacement for Shanda Sansing, who I talked to last year. Unfortunately, despite several attempts to track her down I never got a chance to meet her, presumably because she was swamped with other details including non-greening work. C3 doesn't have a full-time greening coordinator on staff despite running three large festivals a year. That's a troubling sign, and one that showed through as I looked for signs of green life around the venue. Lollapalooza and C3 talk a good game about greening efforts. There is a decent section of the website dedicated to green efforts, Perry Farrell and one of the C3 organizers made a special point of mentioning the green efforts at the Saturday morning press conference, and Perry even gave me 8 minutes of his time to talk about green issues. In other words, there is a strong interest in making this festival sustainable at the top levels of management. That's crucial for any greening effort, but by itself interest isn't enough. Implementation is also essential, and that's where the event fell short in places. Take waste management, for example. 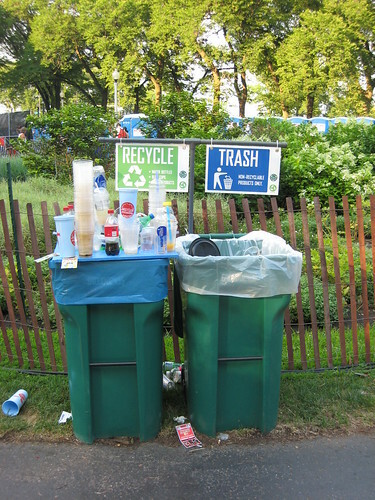 The festival brought on Clean Vibes this year, and every waste station had a recycling bin. Over in the festival's Green Street area (more on that later), there was a Rock and Recycle stand where patrons who brought in 5 or 10 pound bags of plastic beer cups and water bottles could trade the trash for a reusable shopping bag or a T-shirt. Rock and Recycle also had teams of people walking through the crowds with bags to collect recyclable bottles and cups directly from the fans. A waste station shows signs of strain. Roving "Rock and Recycle" teams collect bottles and plastic cups. All of these are great steps, but the message definitely wasn't getting through to the fans. When we left after Saturday night's Rage Against the Machine show, it was like walking across a sea of crushed plastic. The sound made by 10's of thousands of us walking on so much plastic was downright eerie, and noteworthy enough to elicit lots of comments from the strangers around me. After Rothbury, with its hundreds of compost/recycle/landfill stations manned by volunteers and an impressive marketing campaign to get patrons to use them, this was a bitter crash back to business as usual. 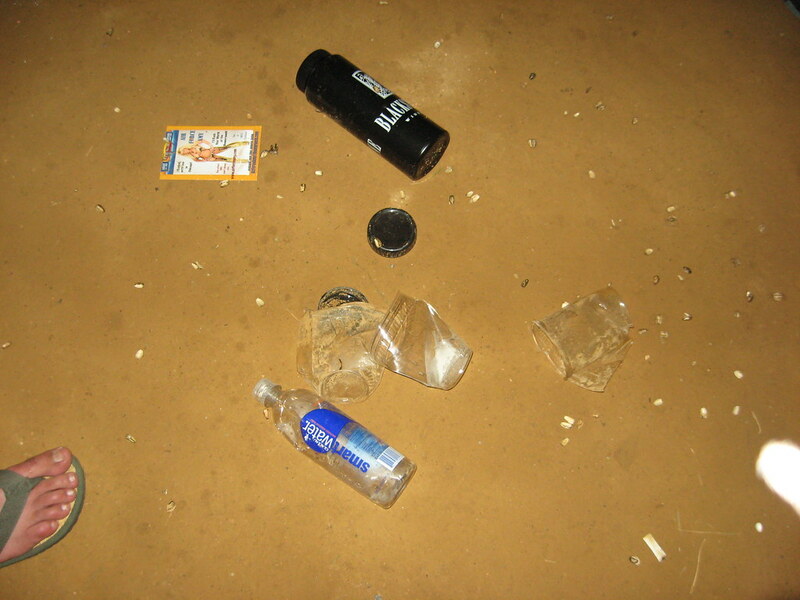 Post-concert trash didn't always make it to the waste stations. Speaking of composting, the Green Lolla section of the website mentions that foodware in the food service area was all compostable, but given the long lines for food and the ease of getting food outside of the festival, I never felt the need to stop by and check it out. Still, since I didn't see any composting bins anywhere in the festival grounds, I'm not sure what good having compostable foodware would be. The website also mentioned a certain amount of local and organic food, something I should have made a point of investigating, but to be honest this wasn't a food-lover's festival--there were far fewer places to get food than I would have expected, and given the distances between stages and the crowds, my group of friends tended to a certain efficiency of motion that precluded a swing over to the food area. 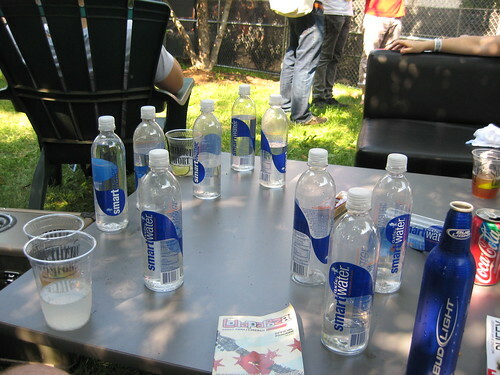 The press tent was plush, but the free perks generated plenty of waste. Even though I didn't manage to sample the festival food, I did make a visit to the small "Green Street" area tucked away into a well-hidden corner. Here, fans could offset their carbon purchases for $5, learn about Chicago's well-developed citywide greening initiatives, buy a variety of recycled art from a handful of local vendors, and visit a huge display from Whole Foods. Compared to similar areas at the other festivals I've been to, this one was among the smallest and had the least information about green initiatives. It's symbolic of the festival's approach to greening--an afterthought tacked onto the event, rather than a centerpiece. Reggie McGuire of local Chicago retailer Futurgarb shows off a handbag made of recycled Chicago Transit maps at Green Street. The festival's other green initiatives were all fairly standard, although not unimportant. There was biodiesel (of an unknown derivation, in an unknown percentage of biodiesel to diesel) in the generators, recycled paper throughout, and a very sizable donation to the nonprofit Parkways Foundation. There was also the pledge of $1 million from organizers to renovate the magnificent Buckingham Fountain that is the centerpiece of Grant Park and of Lollapalooza. Overall, this is a festival that seems to have reached stasis on the green front. The organizers mean well, but greening is clearly not the top priority at an event where every one of the 8 stages is named after a corporate sponsor and even the green area needs a sponsor. The greening efforts here are more than a token gesture, but they don't really seem to be looking to improve year over year, and they definitely aren't engaging the fans. Despite the enthusiasm from management, there's a general lack of green awareness throughout. *Despite the moniker, "micro-brew" was an optimistic euphemism. There was one true small-brewery beer, Chicago's 312, but it was sold out when I got there. The other options were paragons of local craft beer like Stella Artois and Bass. Beer snobs everywhere were suitably disgusted. 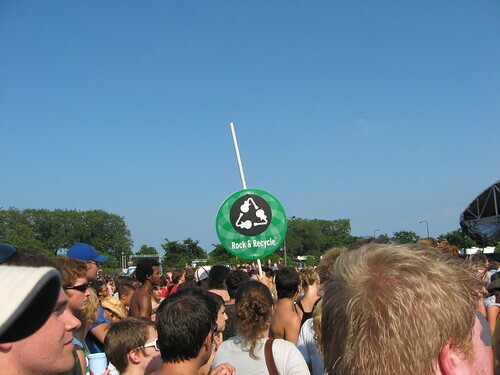 Posted in "Lollapalooza", "Transportation", "festivals", "jason", "recycling"